Just replace the the 2 instances of "Range" with the appropriate values for your file. 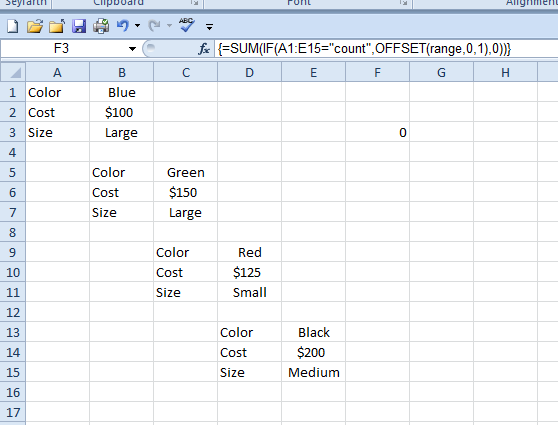 The first should be the range you want to search and the second is where you want excel to paste the sum. You can set this macro to a hotkey so that you can just click it once on each sheet easily. 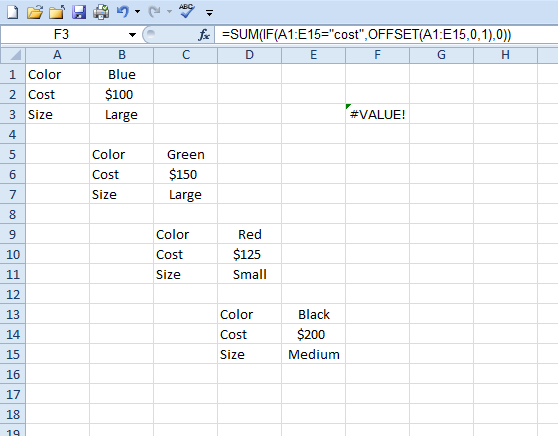 Back in Excel, click View, Macros, View Macros, select the macro you just created (SumCost), click options, and add a letter in the box after "Ctrl+". Remember that as written the macro performs the code on the active sheet. Pres Alt+F11 to open the VBA editor. Right-click where it says VBAProject([name of your file]), Insert, Module. Then paste this code in there:Just replace the the 2 instances of "Range" with the appropriate values for your file. 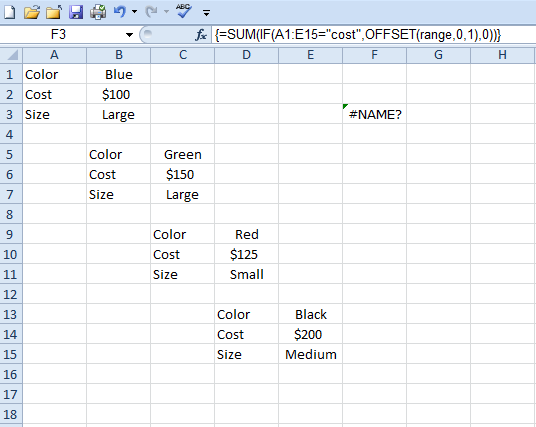 The first should be the range you want to search and the second is where you want excel to paste the sum. This looks like you're saving the macro to the Active workbook. Isn't there a way to save it to the Excel Personal workbook, so the shortcut Ctrl+* is available anytime after? Even the thought of VBA scares me... I'll do it if I must, but is there no way to do this with formulas? Can't imagine why you'd want to use this particular macro in multiple workbooks, but if you did, your link is a great resource. Copy the text into a cell, replace the italicized range with the range you want to look in, and instead of pressing enter to save the formula into the cell, press ctrl+shft+enter. This turns it into an array enabled formula. not one formula in one cell. The sheet is kind of messy and excel works best with neatness. I already tested the formula I posted right above you in a simplified version of AJK's sheet, and it works - in one cell. Yup, totally forgot about array formulas.